Israeli intelligence officers posed as American spies to recruit members of a Sunni Baluch militant group which has carried out numerous attacks against Iranian security forces and civilians, journalist Mark Perry reported Friday at Foreign Policy magazine. The allegation of the Mossad "false flag" operation is based on descriptions of memos in U.S. intelligence archives dating to the second term George W. Bush administration, Perry wrote. The memos allegedly detail the CIA's own efforts to understand media reports in 2007-2008 alleging--apparently wrongly--that the CIA was working with Jundullah to foment instability in Iran. "The memos, as described by the sources, one of whom has read them and another who is intimately familiar with the case, investigated and debunked reports from 2007 and 2008 accusing the CIA, at the direction of the White House, of covertly supporting Jundallah -- a Pakistan-based Sunni extremist organization," Perry wrote. "The memos also detail CIA field reports saying that Israel's recruiting activities occurred under the nose of U.S. intelligence officers, most notably in London, the capital of one of Israel's ostensible allies, where Mossad officers posing as CIA operatives met with Jundallah officials," Perry's investigation continued. The CIA declined through a spokesman to offer comment on the report in response to a request from Yahoo News. An Israeli official did not immediately respond to a query from Yahoo News on it Friday. An unnamed Israeli government official, however, described the "false flag" report as "absolute nonsense" in an article by Israeli daily Haaretz Saturday. Veteran Israeli intelligence observer Yossi Melman suggested that the Mossad officers more likely introduced themselves to Jundullah contacts as "NATO officials"--rather than explicitly as CIA agents. "If such a meeting"--between Jundullah members and Mossad--"took place, it would be more probable that the people involved--assuming they were Mossad--introduced themselves as NATO officials," Melman told Yahoo News by email Saturday. He added that, in his opinion, "Mossad would not risk its special relationship" with the United States "by stealing their identities and posing as CIA." Indeed, as Perry's article notes, the late Jundullah leader Abdolmalek Rigi, after his capture by Iranian security forces in 2010, gave a televised interview 'confession' to Iran's Press TV in which he said he had several meetings with western contacts in Casablanca, Morocco who introduced themselves to him as NATO officials. Still, Rigi said he wondered, "if they are from NATO, why did they not meet with us in Afghanistan--where they have bases and where they can contact us in a much more easy and secure manner? ... When we thought about it, we came to the conclusion that they are either Americans acting under NATO cover or Israelis." Rigi was executed in Evin prison in June 2010. Former CIA officers express skepticism that Mossad would have had many reservations about using or implying American cover to conduct operations. The Mossad "do false flag ops posing as everything you can imagine," a former senior CIA officer who has worked extensively on the region told Yahoo News Friday on condition of anonymity, adding that he found the "false flag" report "very" credible. "They have even recruited Arabs in the U.S. posing as [Central Intelligence] Agency and carrying fabricated credentials." 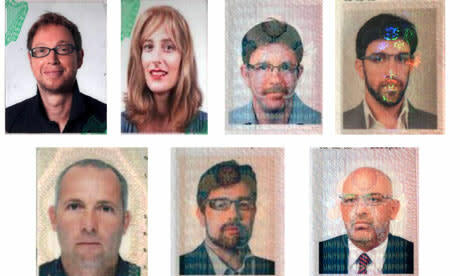 Several close European allies of Israel openly accused it in 2010 of breaching international diplomatic conventions and their friendship, by forging their nations' passports for alleged use by a Mossad assassination team. After Hamas operative Mahmoud al-Mabhouh was found dead in his Dubai hotel room on January 23, 2010, furious Dubai authorities painstakingly reconstructed the alleged assassination plot, publicly releasing photos, close circuit television footage and numerous details about the cover identities, passports, credit cards and travel itineraries of the alleged assassination team. Israel's European allies were furious when confronted with the evidence--published in newspapers around the globe---that their citizens' identities and passports had been stolen to infiltrate the alleged Israeli assassination team into Dubai. The United Kingdom in March 2010 expelled a Mossad official posted to the Israeli embassy in London after a British investigation found evidence that Israel had forged British passports for use in the hit job that killed Hamas operative Mahmoud al-Mabhouh in a Dubai hotel room. Then British Foreign Secretary David Miliband "laid out the case against Israel in parliament, saying a police investigation found 'compelling reasons' to believe Israel was responsible for the copying of British passports, which were used by the killers of a Hamas leader," the Guardian reported on March 23, 2010. Poland in June 2010 arrested another alleged Mossad officer accused by Germany of forging a German passport that was used in the Dubai hit job. The United States, by contrast, did not publicly rebuke its ally over the alleged false-flag operation--though Perry writes the Bush White House "went absolutely ballistic" when it was briefed on it by U.S. intelligence officials. "The report sparked White House concerns that Israel's program was putting Americans at risk," the intelligence officer told Perry. "There's no question that the U.S. has cooperated with Israel in intelligence-gathering operations against the Iranians, but this was different. No matter what anyone thinks, we're not in the business of assassinating Iranian officials or killing Iranian civilians." But in the end, "the United States did nothing," Perry wrote. The United States this week, however, forcefully condemned and distanced itself from a car bomb attack that killed an Iranian nuclear scientist in Tehran. "I want to categorically deny any United States involvement in any kind of act of violence inside Iran," Secretary of State Hillary Clinton told journalists at the State Department Wednesday. Iran didn't seem convinced by the American denials--however unusually adamant and categorical they may have sounded to American observers' ears. On Saturday, Iran's Foreign Ministry handed a letter to the Swiss ambassador in Tehran to deliver to Washington, that reportedly described "evidence" Iran had obtained showing the CIA along with British intelligence had guided the assassination. "We have reliable documents and evidence that this terrorist act was planned, guided and supported by the CIA," the Iran Foreign Ministry said in the letter, Iran state TV reported, according to a report by Reuters' Parisa Hafezi. Updated: This post was updated Saturday with the Israeli official's denial on Saturday of the report to Haaretz; the Israeli intelligence observer's suggestion that Mossad officials may have introduced themselves to Jundullah contacts as "NATO" rather than CIA; and with the report on Iran's letter to the U.S. on the assassination of the Iranian scientist.